Some exciting finds in the Hall last week. In this picture we can see plaster work that has been hiding for over a hundred years! Floor boards were taken up on the 1st floor of the Hall, for part of the cabling work. Sir John Soane who had altered the Long Gallery beneath this, at the end of the 18th century, chopped and changed the room layouts and floors. 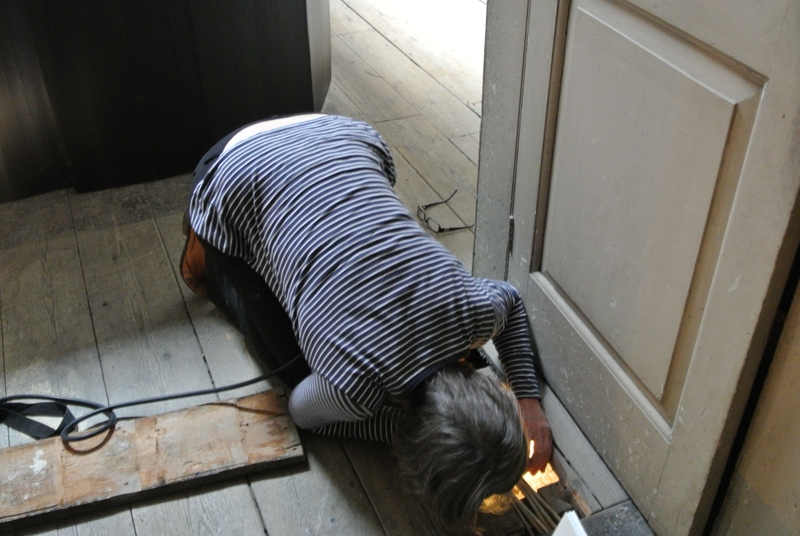 Mary delving under the floorboards. As work in the Hall continues, it is important to protect everything! 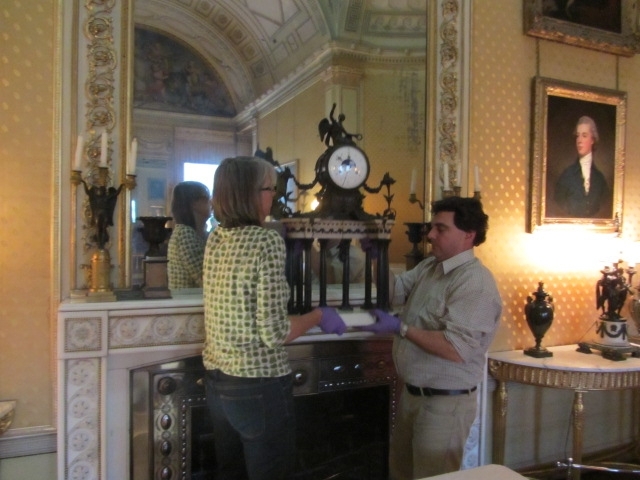 Here Mary is removing the 1790s bronze and marble cased French mantle clock from the Yellow drawing room, with the help of Richard Simmonds, the Horologist. The scaffolding will be going up right there, by the mirror and we don’t want to risk things falling on it. 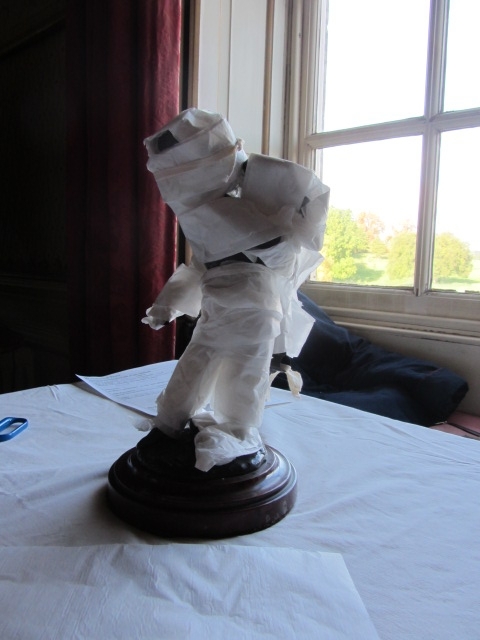 Steph Parsons, Assistant House Steward at Wimpole must have a very steady hand! With such precious items, only meticulous care can be given. The pendulum and loose parts are removed and then it is all carefully dusted inside and out with a pony hair brush before packing away in a correx box. Meanwhile, upstairs in the Chancellor’s bedroom the wrapping continues. 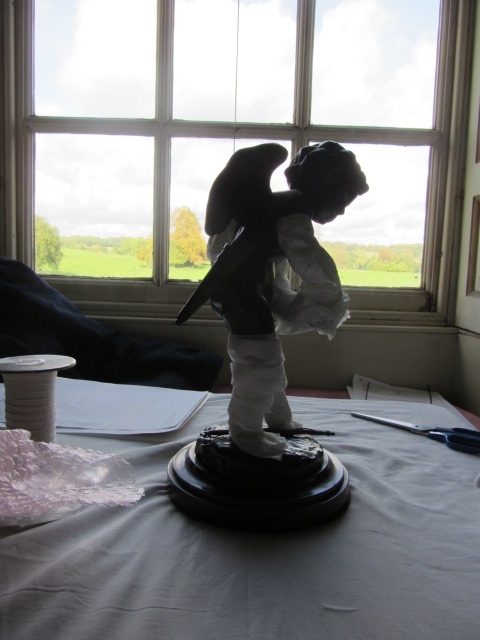 Slightly funnier looking, but equally as important, these cherub figures get carefully wrapped in acid free paper. They’re transformed into safe little Michelin men. Ready for protective storing in boxes in the room. Half Term is upon us and there’s lots to see and do at Wimpole. 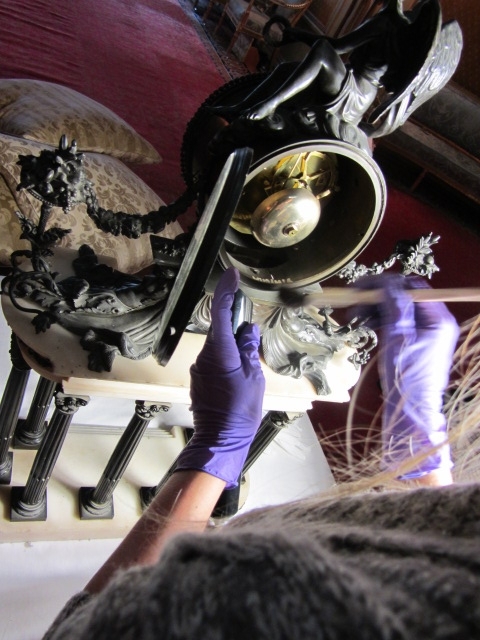 A Paint Matching activity will be going on in the Servants Quarters of the Hall between 26th Oct – 3rd Nov. 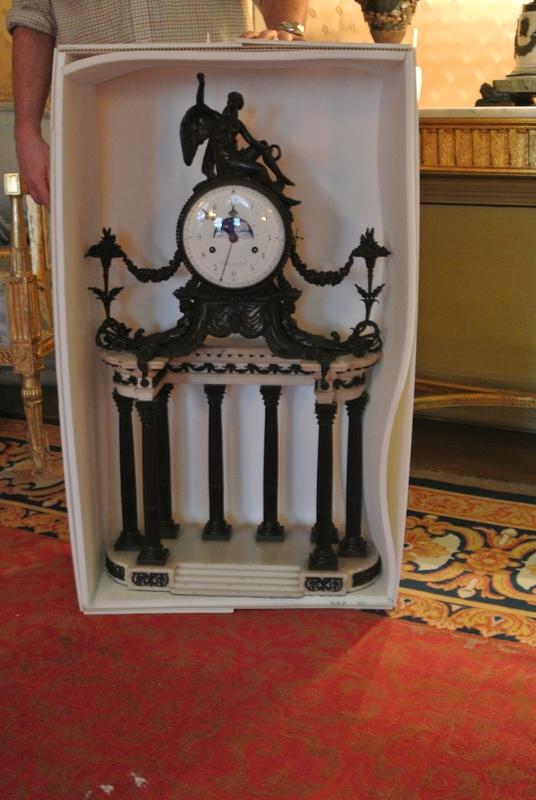 This entry was posted in Conservation, Events, Mansion and tagged conservation, hall, wimpole, wrapped by luciackersNT. Bookmark the permalink. Thankyou! It’s a really interesting project to be involved in.